Azhagi+ possesses a unique feature ("One-of-its-Kind", not available in any other software) by which you can both type and convert [i.e. effect to-and-fro 'Tamil fonts conversion'] in ANY Tamil font, by creating a very simple and straightforward text file of just around 30 lines. Yes, as simple as that. Utilising this unique feature only, Azhagi+ has already been helping one to type (and also convert) in SaiIndira, TamilBible, Tscii, Bamini, UNICODE, TAB, TAM, Vanavil, Shreelipi, STMZH, Diamond, SunTommy, ELCOT-Madurai, ELCOT-Bilingual, DCI+Tml+Ismail, LT-TM (same encoding as that of IndoWord fonts), Gee_Tamil, Amudham, Ka, Shree. And even the abovementioned 30 lines are nothing but just Tamil alphabets (அ, ஆ, இ, ஈ, ..., ..., ...), Sanskrit characters (ஸ்ரீ, ஜ், ஷ, etc. ), Tamil digits, numerals, signs, symbols and general punctuations. So, the format of the 30-lines text file is as simple as you find below. Please note that the lines carrying the words 'aaidham', 'vowels', 'consonants', etc. in the reference link for the text file (text file) is only for the purpose of your understanding. They should not be part of the actual text file created by you for processing by Azhagi+. Yes, that is all to it. So, if ever you own any Tamil font (yes, whatever be the non-Unicode Tamil font) whose style (of characters) you like very much but all these days you were not able to utilise those pretty-looking characters in it, no more you need to maintain that status-quo. Just (JUST ONCE) create a file as above for that particular font and your job is done, for ever. Azhagi+ will thereafter transliterate in that non-Unicode Tamil font for you, for ever. To effect 'conversion' also using this text file and also for all the punctuations to work correctly while 'typing', you need to add a few more important lines, for which you may mostly need my help. Please do contact me for the same. The steps are given below. If you need any clarifications in the steps below, kindly read the guidelines for contacting me in contacts.html page and then contact me. I will be glad to help you out, to whatever possible extent I can. Ensure that you are using Azhagi+ 10.40 or above. Navigate to the "azXMLs\Tamil\Tamil-All-PhoneticTransliteration" folder in the directory in which you have installed Azhagi+ and you can get to see the text files for fonts (SaiIndira, TamilBible, Bamini, etc.) and font encodings (Tscii, TAB, TAM, etc.) already added to Azhagi+ 10.40. For better understanding, please see the screenshot below. Note: If you observe the files in the directory "..\..\AzhagiPlus-Porto\azXMLs\Tamil\Tamil-All-PhoneticTransliteration" (of Azhagi+ 10.40 or above) and also read this, you will realise that for some of the font encodings 'SaiIndira, TamilBible, Tscii, Bamini, UNICODE, TAB, TAM, Vanavil, Shreelipi, STMZH, Diamond, SunTommy, ELCOT-Madurai, ELCOT-Bilingual, DCI+Tml+Ismail, LT-TM, Gee_Tamil, Amudham, Ka, Shree', the 30-lines text files already exist. In other words, there is no need for you, as an user, to create text files for these aforesaid fonts and font encodings. Please note that Latha, Arial Unicode MS, Vijaya, Nirmala UI, etc. are already part of Unicode encoding. So, there is no need to create new text files for these or any of the other existing Unicode fonts. Sai-Sai, SaiEmbed, etc. are already part of Tscii encoding. So, there is no need to create new text files for them. Similarly, SaiMeera is already part of TAB encoding. So, there is no need to create new text file for SaiMeera and all other such TAB fonts too. In other words, if text file already exists for a particular 'font encoding', no need to create new text files for each of the fonts covered by that particular 'font encoding'. In effect, you need to create new and separate text files only for the font encodings for which text files do not exist already. To know exactly for which font encodings you might need to create new text files, kindly contact me. 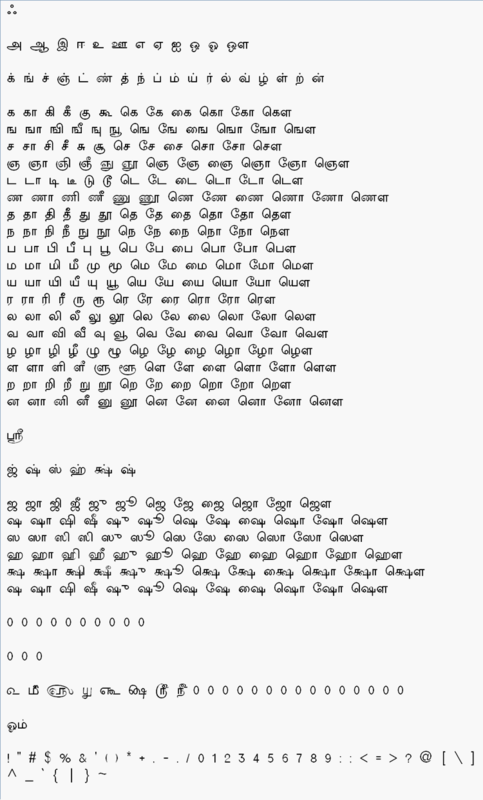 There are 100s of free non-Unicode Tamil fonts of various types in the net. You can create new text files for any of those font encodings whose Tamil characters' style and design you (or your friends/relatives/contacts) like very much. But, please do contact me beforehand so that I can advise you whether it is really necessary to create new text file for a particular encoding since some of the font encodings may be already matching with the existing font encodings (Please read this facebook post of mine fully - https://www.facebook.com/groups/Azhagi/permalink/1747234818649404/ - in this regard). Obviously, for Unicode Tamil fonts, there is no need to create any text file at all at any time since one can transliterate in ALL the existing Unicode Tamil fonts already, using Azhagi+ or any other similar Unicode-typing software. The 'HELP.txt' file tells you how these text files have been organised. So, kindly use this file for your reference. Please note that the lines carrying the words 'aaidham', 'vowels (v)', 'consonants (c)', etc. in the 'HELP.txt' file are for the purpose of your understanding only. They should not be part of the actual 30-lines text file created by you. In order to view the text files carrying Tamil characters of non-unicode fonts in NOTEPAD, you have to click on 'Format->Font' menu item in Notepad and then change font to the corresponding non-unicode font. If you wish to add a new file for a new font you own (say, 'XYZ'), just create "AzhagiPlus-Tamil-XYZ-PhoneticTransliteration.txt" and place it in "azXMLs\Tamil\Tamil-All-PhoneticTransliteration" directory. That is all to it. For better understanding, please see the first screenshot below. Note: If any Tamil characters are missing in a particular non-unicode font, then you can just type '0' (without quotes) for such missing characters. For better understanding, please see the third screenshot below. This way, you can now enjoy typing in ANY Tamil font you have. In other words, if you own a Tamil font, you can straightaway start typing in it, provided you take "a bit of your time" to create the small text file. "Just once" you have to create this small text file for your preferred font. That is all. Thereafter, "for life", you can enjoy typing in your preferred font. 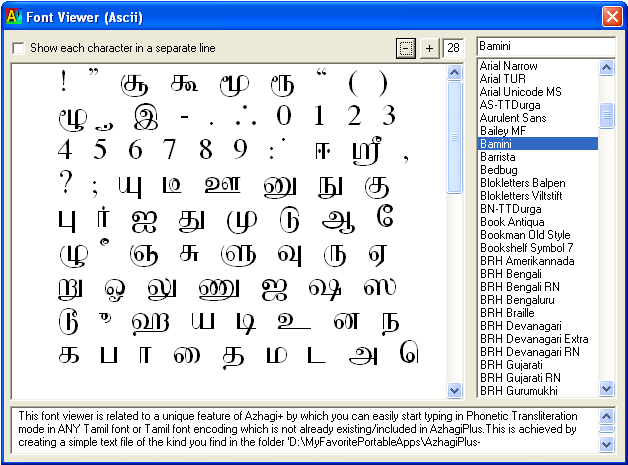 In order to help you in creating this small text file for ANY Tamil font, a "Font Viewer" is available within Azhagi+ itself. Click on "Tools->Font Viewer" and avail it. By availing it, you can see ALL the Tamil characters, English characters, digits, punctuation characters, etc. available inside ANY Tamil font. You just have to copy/paste all those characters into a separate text file, and using these characters, easily create "AzhagiPlus-Tamil-XYZ-PhoneticTransliteration.txt" using NOTEPAD application. This newly created XYZ file should be saved in "Unicode encoding" in Notepad, not in 'Ansi' or 'UTF-8' encoding. Please see screenshots below for better understanding. Instructions are available in TAMIL too - at anytamilfont-t.html. The above picture depicts the contents of a notepad file holding the characters of a Tamil font encoded exactly to 'Tscii' specifications. The 'all' in the last line means that ALL alphanumeric (a-z, A-Z, 0-9), punctuation (comma, period, colon, quotation marks, etc.) and symbol (*, @, etc.) characters can be typed using a Tscii font. So, whenever a font allows you to type all the alphanumeric/punctuation/symbol characters, you have to just mention 'all' in the last line. The '0's in the above picture indicate that characters for signs and symbols (௳, ௴, etc.) do not exist in a Tscii encoded font. The above picture depicts the contents of a notepad file holding the characters of a Tamil font encoded exactly to 'TAM' specifications. The characters in the last line mean that only those characters (amongst the alphanumeric/punctuation/symbol characters) can be typed in a Tamil font which is encoded in TAM encoding. So, whenever a font does not allow you to type all the alphanumeric/punctuation/symbol characters, you have to just mention those characters alone which can be typed out of all the the alphanumeric/punctuation/symbol characters. The '0's in the above picture indicate that characters for digits (௧, ௨, ௩, etc.) and numerals (௰, ௱, ௲) do not exist in a TAM encoded font. How to type availing the file you created? I suggest you first download and install the portable version of Azhagi+ (version 10.40 or above) from steps-in-tamil-portable.html. If this has been already done, good. If not already installed, kindly install the font in which you wish to type (say, 'MyTamilFont1'), in your system. Let us assume the file you created was "AzhagiPlus-Tamil-MyFont1-PhoneticTransliteration.txt". 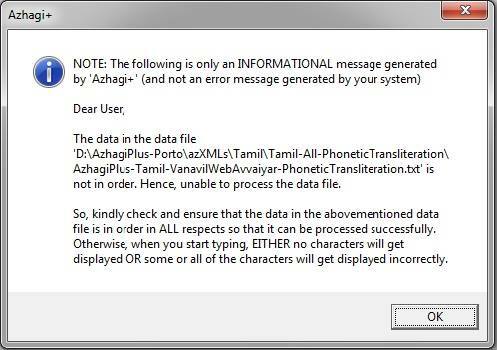 Now, copy/paste the file you have created in the "Tamil-All-PhoneticTransliteration" folder of AzhagiPlus. In case you installed the portable version of Azhagi+ in "C:\MyFavoritePortableApps\AzhagiPlus-Porto", then you can find the "Tamil-All-PhoneticTransliteration" folder in "C:\MyFavoritePortableApps\AzhagiPlus-Porto\azXMLs\Tamil\Tamil-All-PhoneticTransliteration". Start Azhagi+ (10.40 or above). 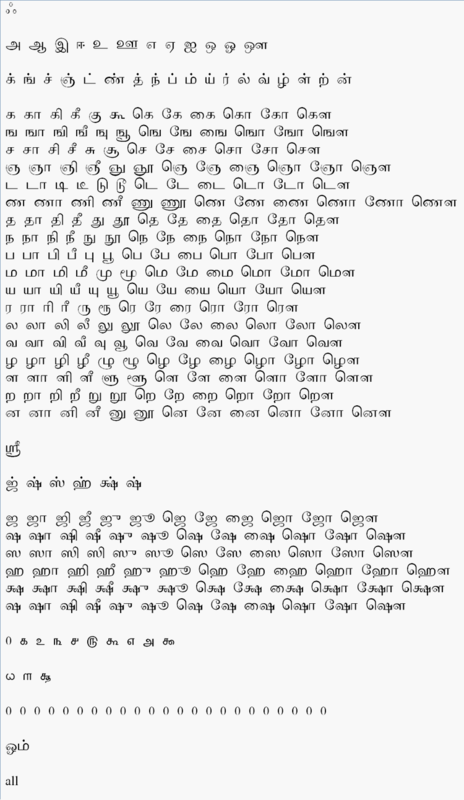 In the opening screen of Azhagi+, in the listbox captioned "List of set hotkeys (only the checked ones available for use)", scroll down and select "Tamil+MyFont1+PhoneticTransliteration" so that this line is highlighted. Now, do not close the screen. Just keep it open. Open MS-Word or any other Unicode-aware editor and select 'MyTamilFont1'. Press the global hotkey 'F10' and start typing in English. You will get the characters in 'MyTamilFont1'. That is all to it. Note-1: It is possible to set a specific hotkey for typing in 'MyTamilFont1' instead of selecting from listbox and then pressing the global hotkey 'F10'. The procedure is given here - oper-plus.html#changehotkey. If you want, you can follow this procedure and set a specific hotkey (for e.g. Ctrl+F9) to type in 'MyTamilFont1'. If you do not want, so be it. The above steps can be followed at any time to type in 'MyTamilFont1' font. After creating your file, when you first avail it in Azhagi+, in case you did make a mistake or two in forming the characters of the file, Azhagi+ will inform you that the file created by you is "not in order". Please see screenshot below. In such cases, please verify the following, starting from point 2. If you still face issues, please do not hesitate to call me (the author). You can mail me to get my phone number. My email contact is present in contacts.html. The "Tamil Digits" line is only for Tamil digits. So, "0, 1, 2, etc." have to be in 'Punctuations' line only. Since the text file has lines in Unicode also (for easy reference purpose), you should have saved the file in Notepad in 'Unicode' encoding only. Not in UTF-8, ANSI or any other encoding. Remember this always. Though saving in UTF-8 format may not induce Azhagi+ to display the "data not in order" error, while typing, characters may get displayed wrongly. So, always remember to save the file in 'Unicode' encoding. Kindly make sure that in characters like ஜு, க்ஷூ, etc., the ugara, oogaara vowel signs remain united with ஜ, க்ஷ, etc. Because, if they remain disjointed, then it would become your foremost mistake. Kindly check to see whether all series of characters are present. For e.g., by mistake, you might have missed a particular series (say "க்ஷ, க்ஷா, க்ஷி, etc. series). If "ஶ, ஶா, ஶி, ஶீ, etc." series is not present in your font, then create that series as "ஷ, ஷா, ஷி, ஷீ, etc." itself. Do not omit that series. Kindly ensure that all characters of a particular series are present. For e.g., in "வ, வா, வி, வீ, வு, வூ, etc." series, you might have missed to type "வு" alone. - Extra spaces between some characters, here and there. If one commits those above-listed minor mistakes, Azhagi+ 'might' take care of them. i.e. I have written code in such a way that Azhagi+ 'might' ignore such extra spaces, lines, etc. But, that does not mean that one can commit these minor errors. He/she has to necessarily avoid these minor errors also. Please note that 'SaiIndira' font is actually of "Tscii" font encoding and hence, as such, including "Tscii" under 'Font Encoding' list is itself enough. But, I have still included 'SaiIndira' separately for the convenience of people who do not know that SaiIndira is of 'Tscii' encoding. Similarly, TamilBible font has its Tamil characters in the same slots as Bamini has and hence, as such, including "Bamini" under 'Font Encoding' list is itself enough. But, I have still included 'TamilBible' separately for the convenience of people who do not know that both TamilBible and Bamini fonts hold the Tamil characters in the same slots. How to transliterate in the encodings of Tamil fonts which you own (i.e. have legally)? Please download and install Azhagi+ 10.40 (from azhagi.com) and you can start typing in the encodings of Vanavil, Shrilipi, STMZH, etc. Before proceeding further, PLEASE download Azhagi+ 10.40 (or above) from http://www.azhagi.com#downloads and also read https://www.facebook.com/groups/Azhagi/permalink/1550082425031312/. With regard to version 10.40 (and above) of AzhagiPlus, more text files will be provided here soon to enable you to effect transliteration and to-and-fro conversion in more font encodings. Open 'txts-all.zip' and kindly extract your specific* TXT files into the "Tamil-All-PhoneticTransliteration" folder of AzhagiPlus. In case you installed the portable version of Azhagi+ in "C:\MyFavoritePortableApps\AzhagiPlus-Porto", then you can find the "Tamil-All-PhoneticTransliteration" folder in "C:\MyFavoritePortableApps\AzhagiPlus-Porto\azXMLs\Tamil\Tamil-All-PhoneticTransliteration". (*) For instance, if you want to type only in 'Ka' font encoding, then from within the files present inside 'txts-all.zip', kindly extract 'AzhagiPlus-Tamil-Ka-PhoneticTransliteration.txt' alone into the "Tamil-All-PhoneticTransliteration" folder. Start Azhagi+ (10.40 or above). In the opening screen of Azhagi+, in the listbox captioned "List of set hotkeys (only the checked ones available for use)", scroll down and select "Tamil+Ka+PhoneticTransliteration" so that this line is highlighted. Now, do not close the screen. Just keep it open. Open MS-Word or any other editor and select a suitable font which will help you type in 'Ka' font encoding. Press the global hotkey 'F10' (or 'F11' or whatever is set in your system as the global hotkey) and start transliterating in English. You will get the characters in 'Ka' font encoding. That is all to it, as far as transliterating in 'Ka' font encoding is concerned. To effect conversion from 'Unicode to Ka', 'Ka to Unicode' and 'Ka to NonUnicode', just open the 'Font Encodings Converter' of Azhagi+ and everything will be ready for you already. That is all to it. Note-1: Not only in the above font encoding, you can TYPE IN THE ENCODING OF ANY TAMIL FONT which you own by creating simple 30-line text files (as you find in 'txts-all.zip'). The simple procedure to create the 30-lines text file is explained in this very page itself. For any queries, you can always contact me, the author. Note-2: It is possible to set a specific hotkey for typing in 'Ka' font encoding instead of selecting from listbox and then pressing the global hotkey 'F10'. The procedure is given here - oper-plus.html#changehotkey. If you want, you can follow this procedure and set a specific hotkey (for e.g. Alt+F2) to type in 'Ka'. If you do not want, so be it. The previously given steps (using global hotkey) can be followed at any time to type in 'Ka' font encoding. Note-3: Apart from typing in transliteration mode in 'Ka' font encoding, you can type in 'TamilNet99, Tamil Typewriter and Inscript mode' too in 'Ka' font encoding. To know the procedure for effecting the same, kindly read this thread - https://www.facebook.com/groups/Azhagi/1565453720160849 - FULLY and THOROUGHLY, esp. "the 11 tips". Updated text files are the text files which have been updated by me after the release of Azhagi+ 10.40, which means these text files are not yet part of the mainstream downloadable setup.exe or portable version of Azhagi+ 10.40. Hence, I strongly recommend you to use these updated text files. Open 'txts-all-updated.zip' and kindly extract all TXT files into the "Tamil-All-PhoneticTransliteration" folder of AzhagiPlus so that the existing files gets replaced. In case you installed the portable version of Azhagi+ in "C:\MyFavoritePortableApps\AzhagiPlus-Porto", then you can find the "Tamil-All-PhoneticTransliteration" folder in "C:\MyFavoritePortableApps\AzhagiPlus-Porto\azXMLs\Tamil\Tamil-All-PhoneticTransliteration". NOTE: If you wish to know the difference between the earlier text files and the updated ones, then before replacing the existing files, extract the text files into a temporary folder (say c:\yourname\tempo\). Thereafter, install a software like WinMerge and use it to compare the existing text files of Azhagi+ 10.40 with the newly updated ones.